Note: It is so important to read the New Testament with first-century eyes. 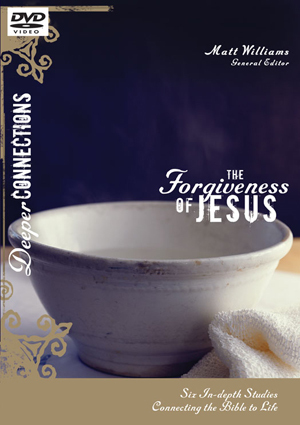 This lesson on the Parable of the Prodigal Son is taken from The Forgiveness of Jesus, one of 36 DVD Bible studies on the life of Jesus in a six-DVD series called “Deeper Connections,” edited by Talbot School of Theology professor Matt Williams. These studies, which have been used by nearly 200,000 people, explain Jesus’ life and teachings from the first-century context in order to help us understand their deeper meaning and how to apply it to our modern context. Each of the video lessons is introduced from Israel and taught by different New Testament scholars from diverse locations such as the Chicago skyline, the Rocky Mountains, the beach, etc. One afternoon, when my son was 3 years old, he was upset with me. He decided that it was time to run away from home. He'd had enough of dad. He was going to go it alone — at 3 years old! So, he walked out the garage, walked down the driveway and started walking down the sidewalk. He got three houses down the street before I ran to him — as fast as I could — to hug him and bring him home. I ran! Of course I ran. That makes perfect sense to us. In the first century, however, a Middle Eastern man never — never — ran. If he were to run, he would have to hitch up his tunic so he would not trip. If he did this, it would show his bare legs. In that culture, it was humiliating and shameful for a man to show his bare legs. So, here’s the question: If it was shameful for a man to run in that culture, why did the father run when his son returned to him? What motivated him to shame himself? Before we answer that question, we have to understand an important first-century Jewish custom. Kenneth Bailey, author of The Cross & the Prodigal, explains that if a Jewish son lost his inheritance among Gentiles, and then returned home, the community would perform a ceremony, called the kezazah. They would break a large pot in front of him and yell, “You are now cut off from your people!” The community would totally reject him. So, why did the father run? He probably ran in order to get to his son before he entered the village. The father runs — and shames himself — in an effort to get to his son before the community gets to him, so that his son does not experience the shame and humiliation of their taunting and rejection. The village would have followed the running father, would have witnessed what took place at the edge of the village between father and son. After this emotional reuniting of the prodigal son with his father, it was clear that their would be no kezazah ceremony; there would be no rejecting this son — despite what he has done. The son had repented and returned to the father. The father had taken the full shame that should have fallen upon his son and clearly shown to the entire community that his son was welcome back home. The amazing application for our own lives is crystal clear. Our heavenly Father has taken our shame through his Son, Jesus, who willingly endured the cross on our behalf. He took our sins’ shame so that we would not have to. As a result, we can be forgiven, restored — accepted. We do not have to fear going home to our Father and confessing our sins, no matter what we have done, or how many times we have done it (remember, Jesus taught his followers to forgive 70 times seven). In the parable, only the father could restore the son to full sonship in the family. In our case, we are sinners, and there is nothing that we can do to restore our lost relationship with the Holy God of the Universe. He calls us and waits — a single repentant step in his direction, and he is off and running to welcome us back home! Not only does God forgive us, but he takes upon himself our shame. He lifts off that weight that we carry on our shoulders for our past mistakes, and willingly wipes the slate clean once more. 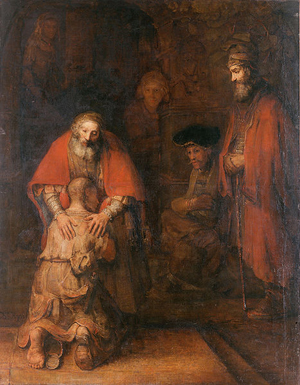 May we experience what the prodigal son encountered upon returning to the Father: “But while he was still a long way off, his father saw him and was filled with compassion for him; he ran to his son, threw his arms around him and kissed him” (Luke 15:20). Good word, Matt! Thank you!! I have heard that the story of the Prodigal Son was well known in Jesus' time, but the ending in the traditional Jewish story was that the lost son remained lost, or even died a horrible and shameful death. This story would be used to reinforce upholding traditional Jewish values and discourage assimilation to the cultures around them. Jesus took this story and turned it into a story that shows God's love and mercy on the repentant. Great commentary. I've often wondered why Jesus allowed himself to experience so much more than the blood sacrifice required by old testament law. Why the desertion/betrayal of friends? Why the beatings, humiliation, shame of nakedness, unfair trials, unbelievable pain of crucifixion ? Why did the prodigals father allow for the shame of showing bare legs and accepting his sinful son back? The crucifixion is about so much more than "fulfilling prophecy ". It shows the passion of God who not only bought our salvation but identified with all our sins and pain . Thank you so much for this article .It made such wonderful reading .I am told this is the only time in the Bible where God is portrayed as 'running' ! Isn't it wonderful that he did this to welcome his repentant son and save him from shame .It sure gives me a better understanding of the expression 'Amazing Grace' !!! Blown away by Our Heavenly Father's Great & Awesome Love to us. thank you so much.i am really blessed and touch by the treasures you have shared. Thank you for sharing this! This adds a whole new meaning to the story! Thanks for the pointers! Can only say Amen to Rich's comments as it reiterates my heart. One can only be so humbled and be so extremely grateful for Gods love for his children. It hits you right in the core of your being and of late I often thought how on earth could I have wasted so much precious time... A real "oh duh" feeling. Gosh how often have I drank from the wells of the sewer, when the fountain of life given water was right in front of me but I was to blind to see. Thank you Abba Father for your unconditional love. Great article! If you look carefully at the painting you will see that one of the fathers hands looks like a female hand....a representation of th maternal love of a mother? The gentle love of a mother? Fascinating. It IS amazing love isn't it? Also amazing when the father runs, too. The father does not run after the son when the son leaves does he? In the same way, God did not create us as automatons, but instead created us with the ability to make choices. The motivation of the son is his desire to live the way he would choose to live, which is not the plans of the father. He rebels against the plans of the father (Garden of Eden). When the son recognizes his need to be saved, only when he is broken, did he heed the Spirit's call to be reunited with his father. So amazing, too, is that the father did not require the son to pay back his inheritance in order to restore fellowship with his father. Grace and mercy come together. To reconcile means to unite (conciliare) again (re). This means it is a 3 stage process - at one time we were in fellowship with God (before the fall). Something had to have happened (the imputation of Christ's righteousness upon us) for us to be reconciled with the Father. Good discussion - what life applications can WE learn from this? Knowing that we have been reconciled, what do we do (not meaning works based salvation) now? I have never understood the meaning of the story with such wonderful cultural explanation. It makes so much sense to me now as how much God loves us. Thank you. Much appreciated . Please pray father will forgive son. We get a real glimpse of our Lord's passion and love with what you have uncovered. We see Him as a loving Father many, many times, as we have seen Him dressing us as we left the Garden. What a wonderful Love, despite our frailities. Nowhere in Scripture does it say any of this. If Jesus wanted to add the element of tunics and shame, He would have said so. This is nothing more than man's imagination. Amy Spreeman, why would Jesus explain to a first century audience that which would have been understood without explanation? I was raised catholic, and any current or former members of the church will tell you, there is a great deal in the bible that they don't tell you. From my point of view its like "We taught you about Noah when you were young, what more do you want to know?" That's how much of my early theology was formed. So when I heard a guest speaker mention this "Kezazah ceremony" that this father was trying to avoid, I had to come looking to see where he may have found this idea. Perhaps you grew up with the same understanding that I did. The father ran to the sun BECAUSE he had been lost and was now found. BECAUSE he loved him, and wanted to make sure the son knew he was forgiven. NOT to try and outrun a mob. Now Im not saying that this is something that a bunch of teachers/preachers have "made up", and although I understand the idea of "not explaining what the people of the day would already know" I would have thought that if THAT was the reason behind his actions than Jesus would have said SOMETHING about it. If for no other reason than to forestall NON Jews from making the same Mis understanding Misinterpretation that so many folks down through the ages have come to. Even looking at the Amplified Bible, which is my personal favorite BECAUSE It explains words no longer in common use, doesn't mention ANYTHING like it. The final "point of contention" is that in searching for information on the term on the internet (which we all understand was written by folks like you or me) there is VERY little information on it (the word) and what little there is, all of it seems to be revolving around back to this story. This is non-sense. No where in the Bible does it say any of this yet you all act as if this is the gospel! What we do know from the BIBLE is that a man must on cover himself to the knee. Stop looking to add to or take away from the scripture. The story is plan as day, the father ran to his child. Oh, men wore pants in the Bible, not tunics, that's a middle eastern custom that was adopted much later. This is what happens when we have people who are scholars full time. Seems like no one takes the time to read the Bible or seek wisdom from it. As a Christian, if it isn't in the Bible, then its not truth. If you look at Revelation 22:18-19, then you are warned of adding to it. Catholics do, so perhaps they should think about their salvation and not adhering to a papal cult. The disgusting decadence of his lifestyle is revolting and unChristian like alone. I thought I might find solace here, but you know, sometimes God sends you somewhere to do His work. This place needs lots of work. Perhaps I did something, but then I may have not. I like this commentary. It is great to know those Jewish traditions that explains us how relevant this parable is to those who are seeking for truth. Truly this parable demonstrates how great the love of God for all. He gave His only Begotten Son to be the substitute sacrifice for our sins. Yes Lord I believe that You are my Saviour. Thank You Lord. I appreciate your concern for respecting the Bible. I do however want to share two important points for your careful, prayerful consideration. Point #1 - I strongly advise that we take care not to accidentally "add to" what John actually stated in Revelation 22:18-19. Revelation 22:18-19 certainly warns readers not to add to John's documented revelations. We are not to attempt to position additions to John's text as though they were included in John's scripture all along. I believe it is reasonable to draw a wider general principle of interpretive application from Revelation 22:18-19. Namely that it not good for anyone to intentionally expand upon other writings of scripture while pretending that their own additions were part of the original texts all along. Even so, I don't think that wider principle is what John had in mind when he issued the specific warning found in Revelation 22. So we need to be careful not to misappropriate it. Point #2 - To affirm faith that the Bible is the definitive source of "truth" is quite a different thing from claiming anything that is not in the Bible is false. Where does the Bible say that any statement not explicitly found in the Bible is categorically false? On what basis can we, then, boldly assert that whatever is not explicitly stated in the Bible is false? On what basis can such a claim be truth if it is not explicitly found in the Bible? Indeed, does not that claim itself insist that it must be "false"? Contextual information can be gleaned from other historical documents. Such information may help us better understand how early readers of the Bible were likely to have interpreted certain passages of scripture. This is a responsible approach to honoring God by attempting to better understand and more accurately interpret the true meaning of passages contained in the Bible. Please know that I'm not trying to make you feel guilty. I'm just trying to help us all be more careful before we jump to conclusions and especially before we judge others around us. Let's look at what the Bible actually does say about scripture. 2 Timothy 3:16 states that all scripture is God-breathed and is useful for teaching, rebuking, correcting and training in righteousness. But we must seek to understand what "God-breathed" means in this context. I believe it means that God motivated, watched over, and guided the writers of scripture to teach true doctrine. Notice that there are some common assertions about scripture that 2 Timothy 3:16 does not make. 2 Timothy 3:16 does not categorically state that God gave writers of scripture miraculous recall of every event down to the most insignificant of details. It does not say scripture is the ultimate science fact-book. What does it say? It says God breathed scripture for certain purposes and that it is useful for those purposes? What are those purposes? For teaching, rebuking, correcting and training in righteousness. I do believe God communicates very important truth to us in scripture. I firmly believe that we should not contradict these important truths based on non-scriptural sources. But let's be careful not to "add to" the claims that scripture makes for itself. Jesus is a genius with His use of parables. I can imagine how different people in the audience saw themselves and the many different ways in which they were affected when they listened to the parable of the prodigal son. I for one ,saw myself as the elder son and i thought i had understood Grace. I think moms and dads should be reminded to praise. I took the liberty to cite Matt Williams article "The Father shouldn't Have Run," in my sermon -to be delivered 9/1/2018 at the McClellanville SDA Church in South Carolina. Appropriate care was taken to indicate the name of the author, the title of the article, the source from which the article was taken (i.e. :Biola Magazine) and the Printer -Biola University. I hope I did not miss crediting anyone else that should have been mentioned. Yes very adult can run after a 3 years old since they are toddlers they would know what they are doing. But as for a child of the prodigal son age, there are circumstances that will force a patent to let go of their grown up child which is not a sign of giving get up on the child, or practicing culture of being ashamed to run. If that was the case he wouldn't have run when the son returned. Wonderful observation of historical and cultural background. However, why do we call the son "prodigal" because the text doesn't mention him in that way at all? Canonical misappropriation perhaps?